Have you ever had a situation or ever wanted to restore your Linux desktop to previous state? Windows has an excellent utility called System Restore to restore the system to previous state, but Linux doesn’t has any native application to do that. No worries, today i came up with application called TimeShift. TimeShift is a application that provides functionality similar to the System Restore feature in Windows and the Time Machinetool in Mac OS. TimeShift protects your system by taking incremental snapshots of the file system at regular intervals. These snapshots can be restored later to bring your system to the exact state it was in at the time when the snapshot was taken. TimeShift is something similar to applications like rsnapshot, BackInTime and TimeVault but with different goals. TimeShift is designed to protect only system files and settings. User files such as documents, pictures and music are excluded. 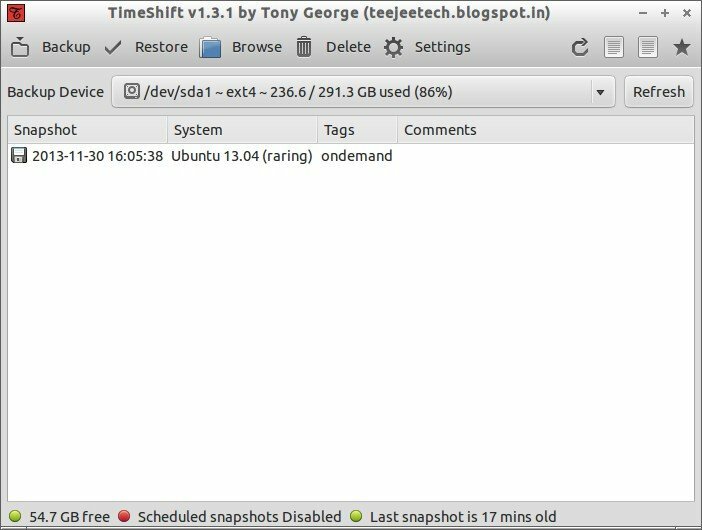 Currently TimeShift packages are available only for Ubuntu based systems, but also the developer has developed packages for other distributions. Before installing TimeShift, you should install the following packages depending upon your distribution. Download the TimeShift packages for other distributions from the following links. After downloading the TimeShift, install it using the following command. Launch TimeShift either from Menu or Dash. At first launch, the application will estimate the system size for snapshot. Click Backup on the Menu bar and take first snapshot of your system. After taking the first snapshot, you can schedule for automatic snapshots on a particular interval. To do that go to Settingssection, enable Scheduled Snapshots and set the backup levels such as hourly, daily, weekly, monthly, boot etc. The Snapshots will be saved on /timeshift location. TimeShift will run at 30 minute regular intervals and take backups only when needed. After completing the first snapshot, you will have a following like screen. The Snapshots will be saved with exact date and time when the backup has been taken. You can restore Snapshots either from the running system or live cd. Restoring backups from a live system requires a reboot to complete the restore process. If your system broken or doesn’t boot in case, you can use the live cd to restore the system to a previous working state. 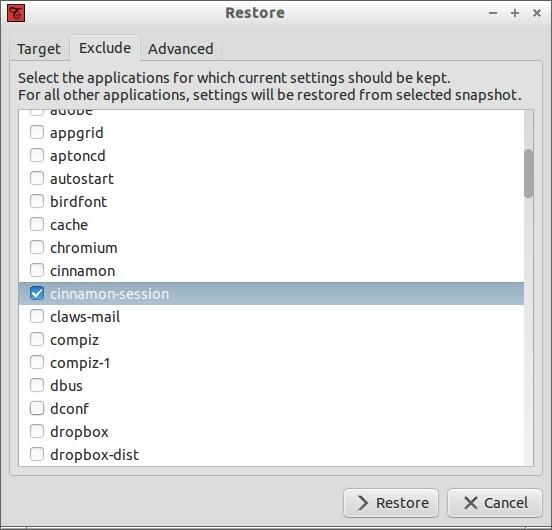 To restore your system to earlier state, click on the Restore button and select the snapshot. Also if you want to exclude some applications from being restored, you can have the option to exclude them. 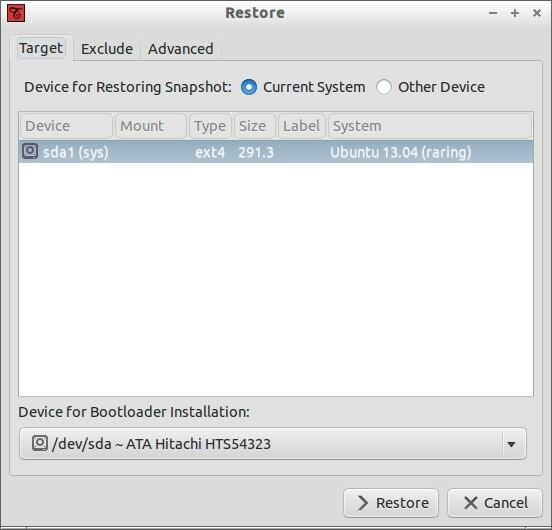 Cross platform restoration is also possible. For example, currently you are using Ubuntu 13.10 and want to try out Linux Mint 16 for a week. After one week you can switch to your old distribution Ubuntu 13.10. Please note that since installing new distributions formats root partition, so you should move the /timeshift folder to new partition. I hope this application will help you sometimes if something went wrong on your Linux desktop. You don’t need to reinstall your system, you simply can restore your system to a previous working state without much effort using TimeShift.